1	Firstly, will the wealthy pay more tax as the plan assumes? 2	Secondly, will the economy of the country grow faster? 3	In any of these scenarios, who is likely to harmed, the rich, the poor or both groups? As to the first question, let’s consider history. There have been three major tax cuts in the modern American era, four if you add that of Trump. As the latter is rather recent, we can ignore it for the moment. The first tax cut was in the early twenties, when the top marginal rate was cut from 70% to 25%. The result was that tax revenue rose from $719 million in 1921 to $1164 million in 1928, an increase of more than 61%. In the same period the share of the tax burden paid by the rich rose from 44.2 percent in 1921 to 78.4 percent in 1928. In the Kennedy era top taxes were cut from 90% to 70%. That had the effect that tax revenues climbed from $94 billion in 1961 to $153 billion in 1968, an increase of 62 percent (33 percent after adjusting for inflation). The relative burden of the wealthy rose from 11.6 percent to 15.1 percent. Ronald Reagan introduced a dramatic tax cut in 1983. This was followed income tax revenues rising dramatically, by more than 54 percent by 1989 (28 percent after adjusting for inflation). The share of income taxes paid by the top 10% of earners jumped significantly, climbing from 48.0 percent in 1981 to 57.2 percent in 1988. Tax takings probably rise after a tax cut because taxpayers paying low taxes have less incentive to evade or avoid taxes, and because they have more incentives to produce, as their take-home income increases the less tax they are liable for. In the years following on the twenties tax cut (1921-28) the GDP of the US grew by 42% in real terms. Between 1961 and 1968 it grew by 43%, and in the Reagan years by 28%. In each case GDP growth more than doubled compared to the equivalent preceding period. The low-tax countries outgrew the high-tax ones by a country mile. 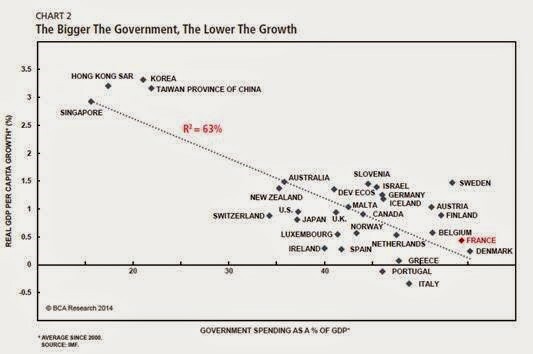 This confirms the theory that the more the government takes money out of the economy by way of taxes, the less it grows. 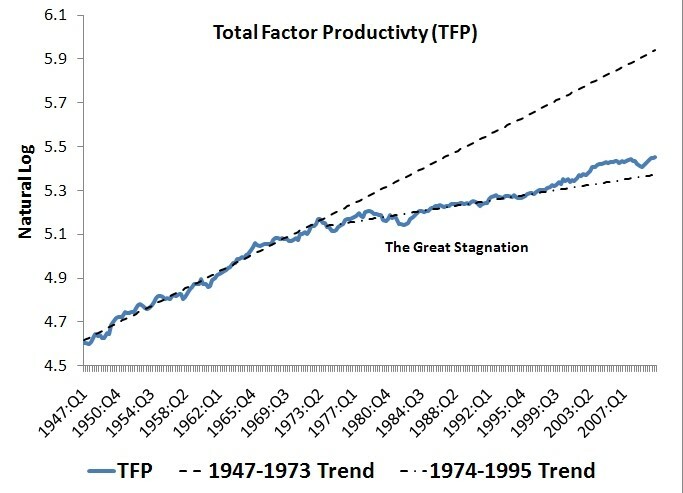 This would be explained by the fact that taking wealth out of the productive private sector and allocating it to the unproductive state sector reduces productivity of that wealth, and hence growth. It is further explained by incentives: by punishing citizens for earning income, the state creates a disincentive to produce. It should be added that if this confiscation disproportionately affects the rich (as is usually the case and certainly in terms of the current proposal) , the normally most productive section of the economy is harmed most. As for the argument that a low tax burden will cause government debt to grow, it is clearly not the case based on the above figures. 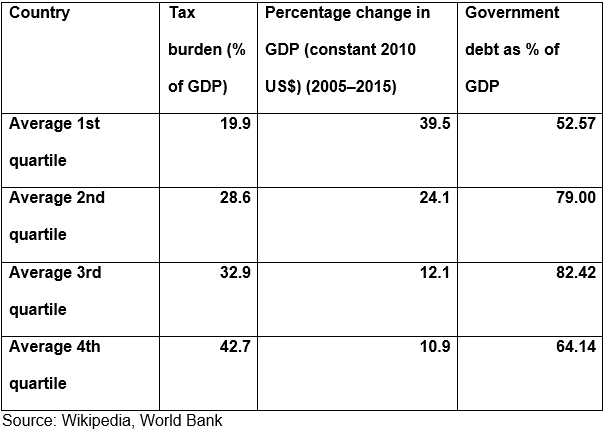 If anything, a lower tax burden seems to be associated with a slightly lower average public debt. Debts are run up when governments borrow (and then spend) too much. In a review of major studies between 1983 and 2012, Will McBride, former Tax Foundation chief, located 26 studies in total, out of which all but three, and all in the last 15 years, found a negative effect of taxes on growth. There is no question that increasing the tax burden on the rich to, say 70%, will in the net result increase the aggregate tax burden of the US dramatically. The reason is that the rich already pay the lion’s share of taxes. For example, in 2016 the top 1 percent in the US paid a greater share of individual income taxes (37.3 percent) than the bottom 90 percent combined (30.5 percent). Increasing the marginal tax rate to something like 70% is thus very likely to depress both tax takings and economic growth. That will mean less money for welfare, health and education, reductions in investments and employment and lower wages. Whilst those outcomes are designed to reduce the income of the rich, they are almost guaranteed to harm the middle class and the poor more. This is a response to an article by Montier and Pilkington (https://www.advisorperspectives.com/commentaries/2017/03/27/the-deep-causes-of-secular-stagnation-and-the-rise-of-populism). They identify four main changes in the modern economy that they say caused the current stagnation. The article is typical of the type advanced often nowadays by those who don’t want to accept the superiority of free markets, but realise that real old-school socialism has been thoroughly discredited. They then argue that the so-called “neo-liberal system” has failed, and propose an interventionist/developmental state model. My response hopefully arms the reader to deal with many of these fallacious contentions, and so should have more general application. The first alleged mistake in economic management is the abandonment of the policy of “full employment” followed after WW I. In support of this the authors suggest that Keynesian policies of government spending ensured full employment during the “golden era” of low unemployment (1948-1970). After WW I and before the depression (1920-29), spending was relatively low, and unemployment was low too. 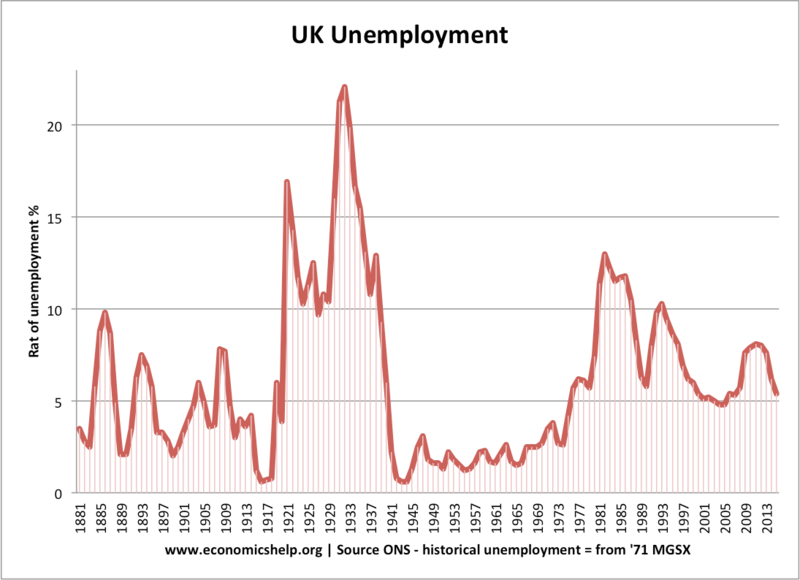 In fact, unemployment during that period was on average about the same as in the “golden era” of 1948-1970, without the aid of sky-high state spending. In the period after the war the trend line of federal spending was gradually upward (1948-1980) – and so was the curve of the unemployment rate. 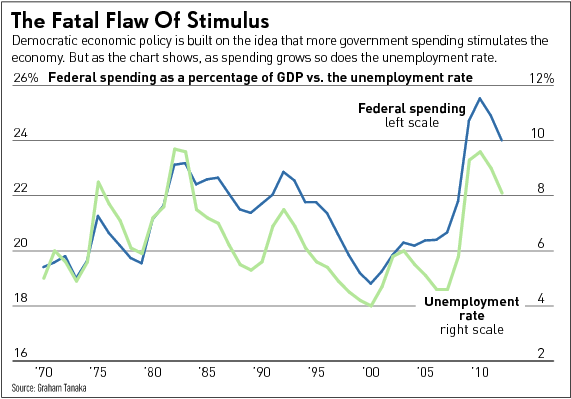 Reagan reversed the spending trend, and also the unemployment curve trended down (1980-2000). A simple glance at the curves of federal spending and unemployment in the period 1970 to date will show that as spending increases, so does unemployment. This does not necessarily mean unemployment was caused by spending growth, but it sure as hell does not prove the opposite, namely that spending kept unemployment levels down. Notably in the modern era, the Reagan years (81-89) were marked by a simultaneous decline in spending and unemployment. The same applies to the period of the Clinton administration – 1993-2001. On the other hand under Bush II, spending grew as did unemployment. Obama reversed the trend again. Significantly, unemployment fell by 10%, after much of the New Deal had been declared unconstitutional in 1935. The War’s low unemployment was abnormal. Bear in mind the so-called war economy was a case of government deficit spending to manufacture arms and ammunition, while Americans went hungry. 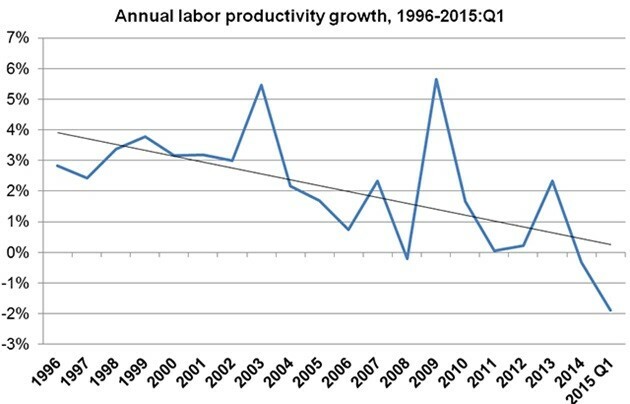 It was not productive employment. 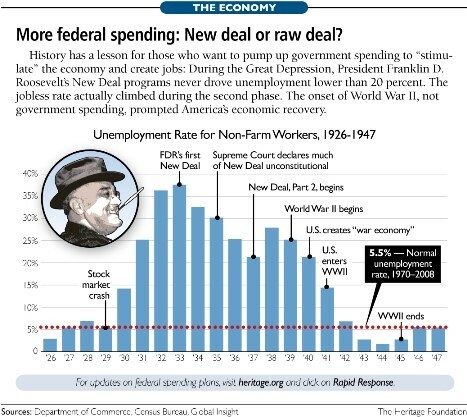 Equally importantly, after WW II the government slashed spending by 70% (see the spending graph above), immediately restoring normal unemployment patterns. inflation trend began long before, in 1960. Furthermore, the inflation rate was in tandem with federal spending. So for example it peaked at 15% during the War (1945) when spending was at a historical high, and then declined in step with spending declining until the early sixties, when it reached about 2%. At that stage government spending was a relatively modest 18%. Then, from about 1962, both spending and inflation increased, until inflation reached about 11% in the early 1970s. Then it reached another peak of about 14% in 1980, which coincided with a further spending peak (just before Reagan took over) of about 24%. –	Unemployment declined from 10% to 4%. What the authors do not mention either, is that in 1971 the US abandoned the gold standard, (to which the dollar had been pegged), causing the value of the dollar to drop. That caused inflation as dollars flooded the market. Because the OPEC oil suppliers were paid in dollars (which were losing value fast), they increased the price of oil. So it was inflation that caused the rise in the oil price, not the other way around. 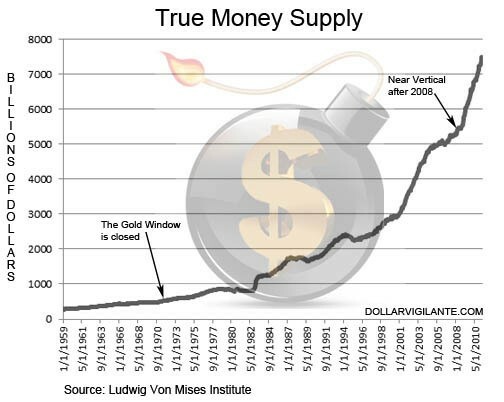 What is clear is that the delinking of the dollar from gold added to the inflation woes of the US. This bit of history makes it clear that there is a link between state spending, inflation and unemployment. At present the unemployment rate is 4.7%, better than the “Golden era” average of the sixties of 4.8% (while state spending in 2016 was 34 % of GDP – down from 43% in 2009 – and inflation at 1.26%. The statement that unemployment “stayed permanently elevated” and needs inflationary, Keynesian spending to reduce it, is just not true. In the Obama era, federal spending decreased as percentage of GDP, as did inflation. The authors’ “solution” to low incomes and high unemployment is NAIBER, which is a scheme whereby the government must employ all unemployed workers at a basic wage, end use their services to perform charity, public works or whatever. We have tried spending money. We are spending more than we have ever spent before and it does not work. I say after eight years of this Administration we have just as much unemployment as when we started … And an enormous debt to boot! The incentives of the scheme are all wrong. Workers will not be required to be productive, because their employment will be guaranteed. Even workers in the private sector will know that their jobs are safe in the sense that if they were to be fired for not doing their work, the safety net of the state would catch them. The state as employer, for its part, will not need to use their service productively, because, well, it is the state. Any waste can after all be funded by the taxpayer. The state will run up costs and debts. The state’s share in the economy will grow. Wealth creation will suffer, as always happens when the state’s share in the economy grows. Implicit in the NAIBER solution is that it will be inflationary, because the authors’ criticism is precisely that the modern “neoliberal” system wrongly targets inflation. It follows that what they really want is inflationary state spending. As we have seen above, it leads to serious economic problems. The period of 1960-80 was one where state spending, inflation and unemployment were ramped up in tandem. Next, the authors blame globalisation, notably immigration increases and international trade, for the stagnation of the economies of the US and other developed countries. Dealing with immigration first, while it is true that immigration to the US is at a historical high, immigrants’ median income is on the whole lower than US workers’ . At the same time, it rises more quickly than that of US workers, and currently unemployment among immigrants is 3.7% , significantly lower than that of citizens. That indicates that immigrants assimilate well into the labour market, which is a key component of social integration. These figures also suggest that initially immigrants do jobs at salaries that citizens are not prepared to accept, and thus are unlikely to disrupt citizens’ employment opportunities. 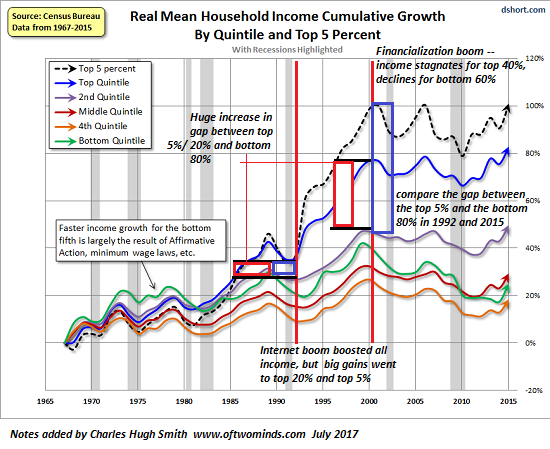 What is true of course, is that over the last decade or so, American workers in the lower quintiles have seen their incomes decline as a relative share, and in real terms. The reason is that the American market was skewed by successive interventions by the Federal Reserve since the time of Greenspan, in the form of money printing. The effective negative interest rates maintained by Greenspan, together with anti-discrimination policies in the bond market and the implicit guarantee that banks would not fail, led to the 2008 housing crash. That destroyed incomes of poor and middle class people as unemployment soared and home buyers defaulted on mortgage payments. The next 6 years was followed by a period of Zero Interest Rate Policies (ZIRPS) and Quantitative Easing (QE), fancy names for more money being printed and pumped into shares and bonds. That caused an unprecedented boom in the stock market, benefitting rich people, and resulting in dwindling pay cheques in the hands of the middle class and poor of America . 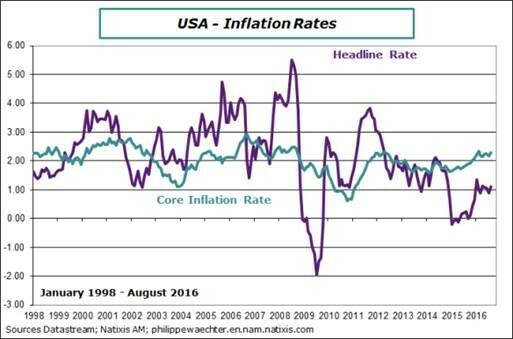 The inflationary policies of Greenspan caused headline inflation to rise from 1% to 5.5% between 2001 and 2008. 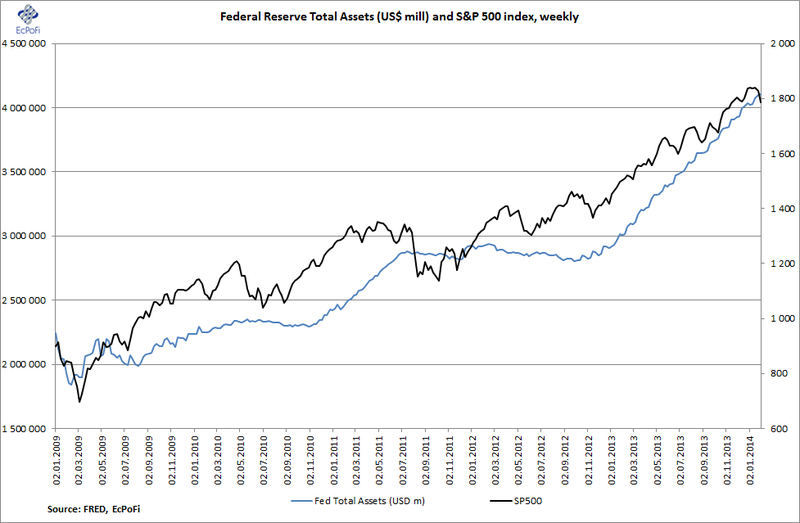 In the Obama years the Fed did not pump the excess money supply into the consumer market, but into assets. The result was that there was little impact on consumer prices, but the stock market was artificially inflated . That was a boon for the rich and the worst blow to the poor. It also devastated productivity, as investment in paper assets do not improve technological investment or training of workers. That is the real reason for the declining incomes of the poor and middle classes. If the economy had been healthy, investment would have been made in training, machines, information technology and productive assets, instead of share portfolios. US productivity has surely also been depressed by the poor school system, which, despite the government being one of the most prolific spenders on education as percentage of GDP in the world, has failed to show any significant improvement in reading, maths and science teaching over the past 50 years. Immigrants have always been part of the American labour market. The rising employment level of citizens (at higher wages than immigrants) suggests that immigrants are not taking their jobs or depressing their income. There is no evidence that immigrants take US citizens’ jobs. Quite the contrary. There is a reason why manufacturing has declined in developed countries. It has to do with the relative skills level of countries, and wages pay for different levels of productivity. The modern economy is knowledge-based. Countries with high-tech products and services such as information technology, consulting services, research and development, have a competitive advantage. Countries with lower skills levels then have to compete with the advanced economies by performing manufacturing jobs at lower wages. Why do the authors want Americans to work in factories? They should be grateful that the economy has graduated to a knowledge- and hi-tech-based industrial complex. Insofar as a section of the workforce has been left behind, then improve the education system. The US school system is positively mediocre compared to the good systems of the world, such as most Nordic countries, most oriental societies and Switzerland. That is a story on its own, of course. But in short, the US education system fails because it is a centralised, government-driven system in a highly diverse society. All the successful systems in the world are either culturally homogeneous (Shanghai, the Nordic countries, Germany) or highly decentralised or privatised (the Netherlands, Hong Kong, Chile, Finland, Switzerland), or both homogeneous and decentralised (Hong Kong, Finland, the Netherlands, Shanghai). As regards trade due to globalisation: What would the authors have us do: should countries like the US have less trade with the rest of the world? Presumably not. Then one supposes the problem is the dreaded trade balance, namely that countries like the US import more than they export. The answer to that is simple: If the trade balance is a problem, then increase value for money by improving productivity. 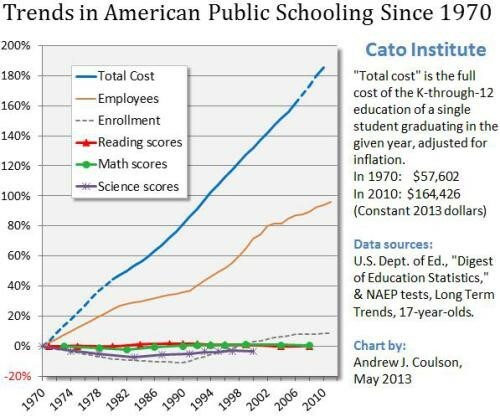 Improve education, reward real bricks-and-mortar investment, not paper pyramids on Wall Street. The authors’ prescription to deal with the effects of globalisation, with a view to repatriating “good” manufacturing jobs back to the developed world, is import substitution by way of targeted subsidies for products that can be manufactured more cheaply abroad – in other words, good old-fashioned protectionism through subsidies. In principle import substitution subsidies are the same as protective tariffs. In both cases the state uses taxpayers’ money to increase the relative price paid by consumers for imports. In the subsidy scheme the taxpayer firstly funds the subsidy, and secondly pays for the inevitably reduced value for money brought about by restricting the competition of imports. In the tariff scheme the consumer pays a tax on imported goods (which adds no value to the purchase) or buys inferior value for money locally. Both are destructive of growth, unproductive and wasteful. 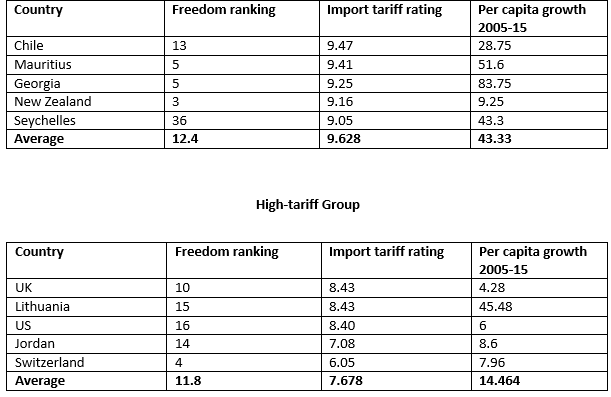 For example, here are 5 countries with high ratings for import tariffs according to the Economic Freedom of the World Index (ie with few or no import tariffs), compared to 5 countries with lower ratings. 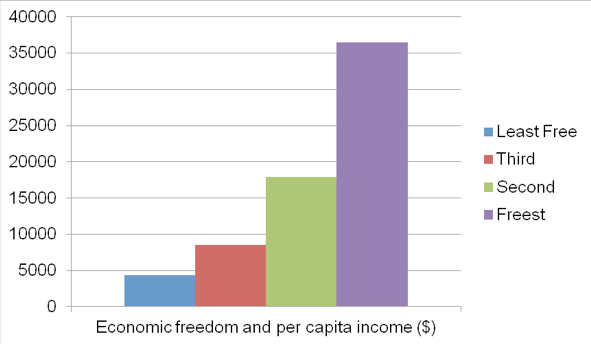 Both groups come from the first quartile of economic freedom, and save for separating them into low- and high-tariff groups, have been selected purely so as to have about the same degree of economic freedom on average. Any difference in average performance is therefore not due to general economic regulation, the significant difference between the two being the degree of import protection only. It follows that the converse, increased protection, will lead to less growth, which will scarcely be likely to address the problem of lower income for workers that concerns the authors. If anything, there should be more international trade if we are serious about addressing income of poor and middle class people. The next aspect that the authors tackle is labour regulation, contending that labour flexibility has led to lower incomes in the developing world. As a general proposition, this is just not so. 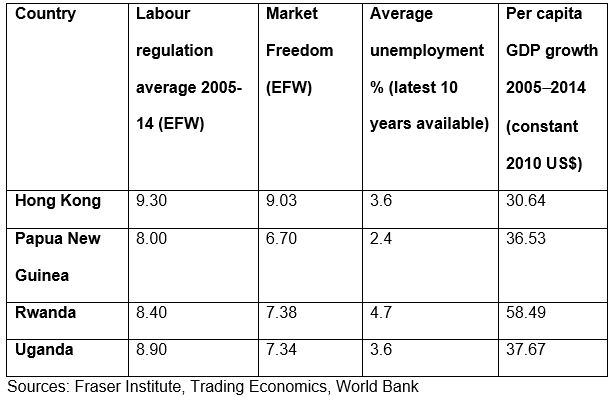 In all these cases the countries maintained low levels of labour regulation, low unemployment and growing incomes. •	Between 1991 and 2004, unemployment fell from about 11 per cent to under 4 per cent. •	During the same period, the labour-force participation rate increased from 63.8 to 66.9 per cent. •	Most significantly, GDP per capita in real terms increased from $12 230 to $25 420. Also Denmark makes the point. In the period 1994-96 Denmark deregulated important aspects of its labour market, including hiring and firing rules. The result was that unemployment declined from about 10 percent to about 3 percent between 1995 and 2009, while the country’s per capita GDP grew by 16.5% over the same period . It is simply not true that deregulation is likely to lead, or has led, to a plummeting of labour standards. Quite the contrary. 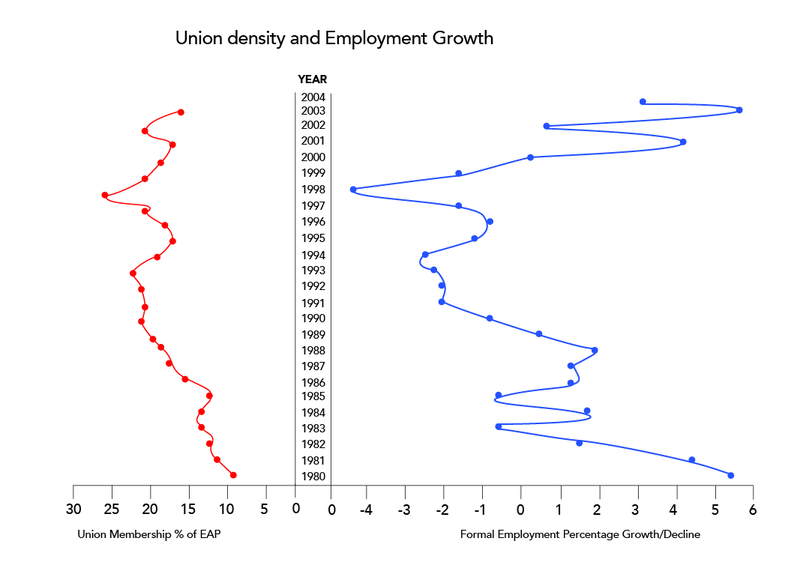 As the union density rose from 1980 onwards, employment growth declined from 5.5% p/a to a negative of -4% in 1988. The two curves run in parallel like rail tracks. In 1947, the United States passed the TaftHartley Act, which affirms the right of states to enact right-to-work laws. Under these laws, employees in unionised workplaces may not be compelled to join a union or pay for any part of the cost of union representation. In anticipation of Michigan’s adoption of right-to-work laws in 2013, the Mackinac Center for Public Policy in Michigan examined the economic effects of right-to-work status. Unsurprisingly, right-to-work states have far lower union density than non-right-to-work states (8.83 per cent as opposed to 15.59 per cent). For present purposes, the most significant impact is on employment growth. Right-to-work states in the period 19702011 grew employment at a rate exceeding that of non-right-to-work states by 0.8 percentage points per year. Importantly, despite growing jobs roughly three times faster, right-to-work states did not sacrifice in terms of personal income. On the contrary, according to the study ‘states with right-to-work laws enjoyed an annual average increase in real personal income of 0.8 percentage points … compared to what they would have experienced without such laws’. Montier and Pilkington compare countries internationally by way of a scatter gram to show that countries with high union density have low unemployment. They also show that during the period of low unemployment (1948-1970) union density was higher. This is a classic case of comparing apples and pears. In order to know if unionisation increases employment, we must surely control for relevant factors. 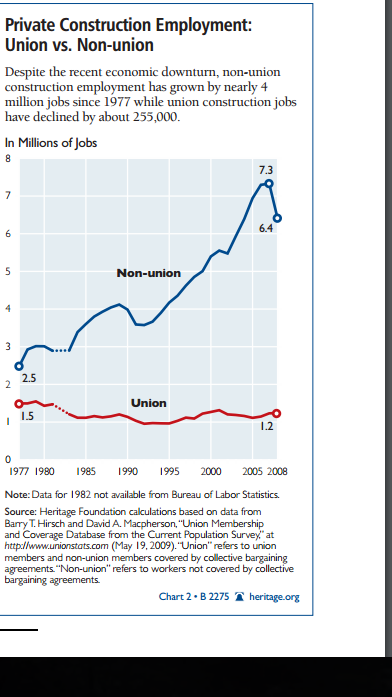 Union density, inflation and unemployment reached a simultaneous peak in the early 1980s. That was when Margaret Thatcher stepped in and broke the back of the union movement. 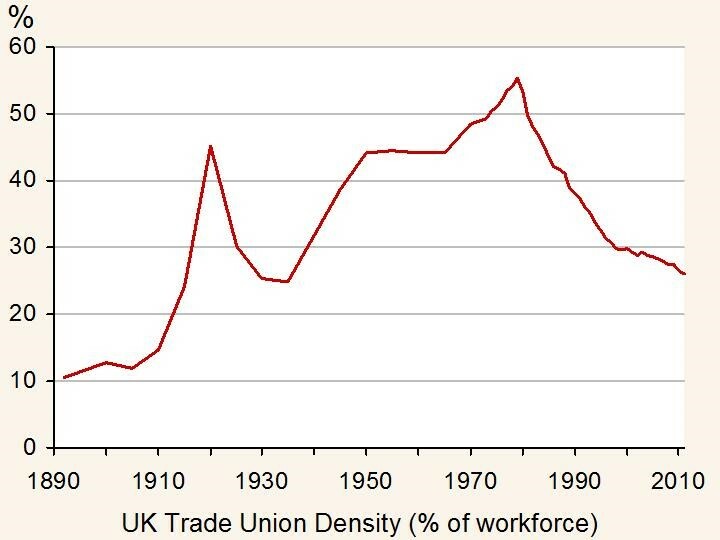 As trade union density declined, so did unemployment and inflation. 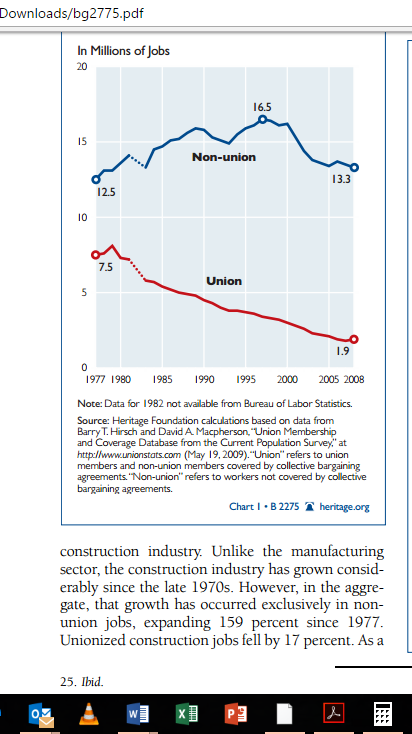 So, trade unions are a problem for unemployment. The same applies to labour laws generally. In the United States, the federal government regulates many aspects of labour relations. But over and above the federal laws, each state also has the right to enact local laws that regulate employment. Any state could, for example, enact a minimum wage for the state that exceeds the national minimum wage. This makes America an ideal testing ground for the effect of labour laws on employment creation, because many of the economic conditions in states are determined by federal legislation and circumstances that are shared by all states; and citizens of states are free to move from state to state to find work. Based on a survey of employment policies conducted in 2009, the US Chamber of Commerce developed an Employment Regulation Index (ERI) to measure the impact of state labour and employment regulation in each of the 50 US states on a scale of 1 to 100, with a score of 100 denoting conceivably the most heavily regulated state. The ERI is based on rankings of 34 measures of state labour and employment policies covering six categories: the employment relationship and the costs of separation; minimum wage and living-wage laws; unemployment insurance and workers’ compensation; wage and hour policies; collective-bargaining issues; and the litigation/enforcement climate. Using the ERI, each state is assigned an overall rank – ‘Good’, ‘Fair’ or ‘Poor’ – as an indicator of the extent to which the state’s labour and employment policies regulate labour. 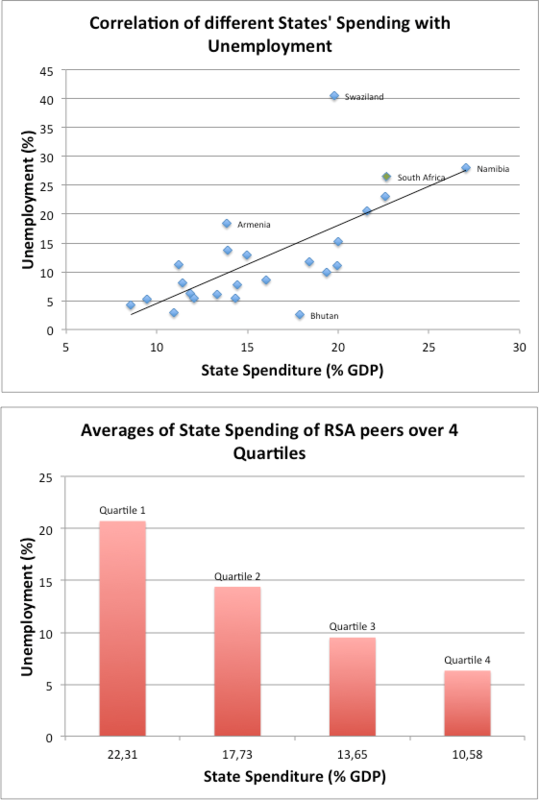 It was assumed that states with a ‘Good’ rating have strong pro-employment policies, while those with a ‘Poor’ rating have policies that inhibit job creation. So, when labour law is isolated as a factor, it is and remains a job-killer. That does not mean its effect cannot be ameliorated, as for example in the Nordic countries that have national corporatist negotiations. The difference is, they are all homogeneous societies. No multi-ethnic society like America has ever succeeded with a corporatist model. The authors further argue that the theory that minimum wages do not suppress employment, is not correct. 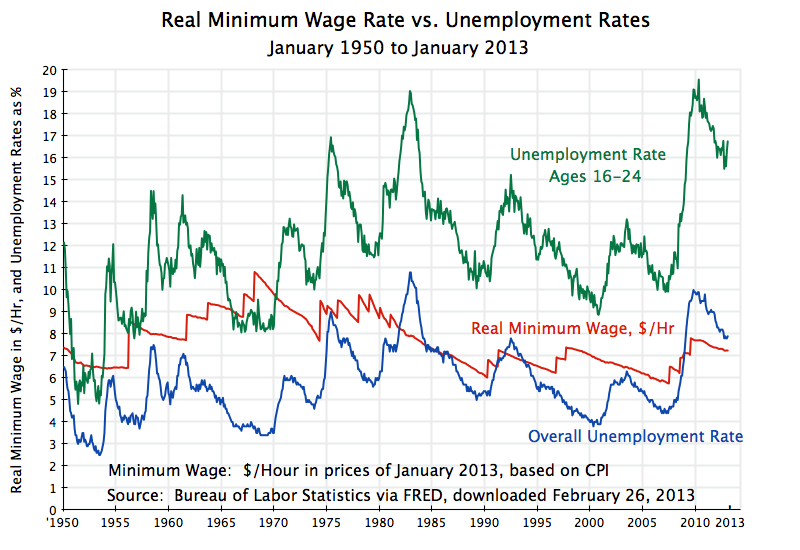 This argument they support with evidence that the minimum wage as percentage of average wage was higher during the so-called “golden era” when unemployment was low, than when it unemployment was high in the period from 1970 onwards. This is a poor argument. Any economist worth his salt will tell you that isolating one factor – the minimum wage – and arguing that it caused or did not cause unemployment, without controlling for other relevant factors such as the general regulatory regime of the economy, the share of government spending, the education of the society and external shocks, is just a nonsense. 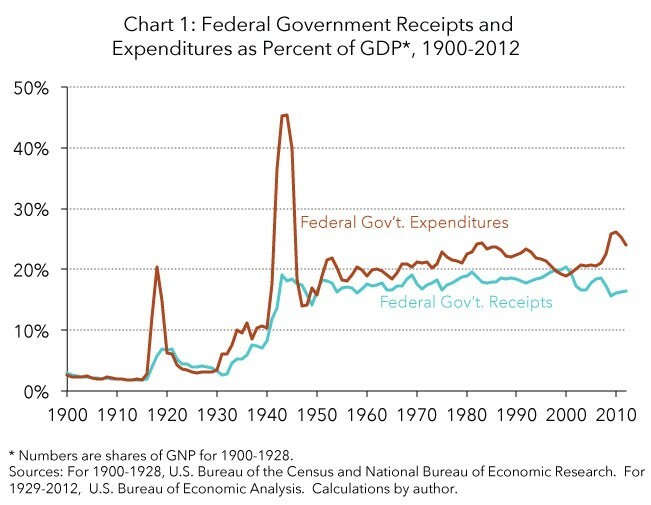 For one factor, just look at the share of government spending, the records of which appear above. In the so-called “golden era”, spending was lower than in the high-unemployment era of 1970-80. Then spending declined over the period 1980-2000, during which unemployment likewise came down. In the real world, minimum wages have proved to be much of a muchness. Everyone agrees that if we imposed a minimum wage in the US of $50 per hour, or in SA of R15 000 per month, the economy would take a severe knock and millions would become unemployed. Yet in the real world minimum wages are set at far more modest levels, resulting in far less drastic effects, or sometimes none at all, and thus ongoing bickering among economists as to their importance. The reason for this is that in most real-life situations it is easy to demonstrate that the impact of minimum wages is at worst, modest. The one reason is that only a tiny minority of workers are affected by minimum wages, namely those marginal workers at the bottom rung of productivity. No country’s economy has come to a standstill because of it. 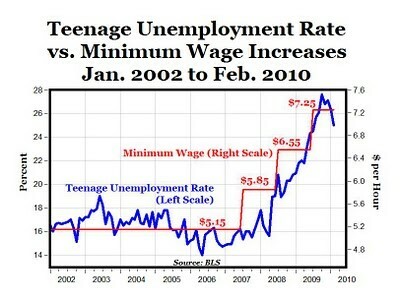 Yet studies consistently show that teenage employment is significantly harmed by minimum wages. The next graph makes the same point, over a longer term. Note especially the decline in the minimum wage, and the concomitant drop in teenage employment from 1980 to 2000. Again, one remains mindful of the fact that this is not proof that minimum wages cause unemployment. 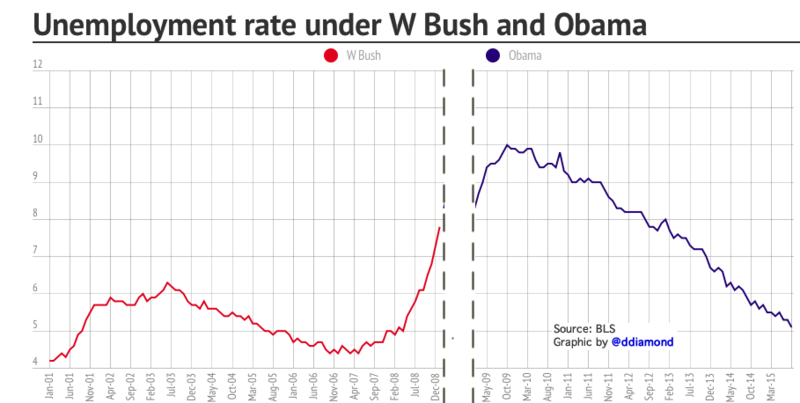 But it certainly shows that the converse is not true, namely that unemployment is lower when minimum wages are higher. 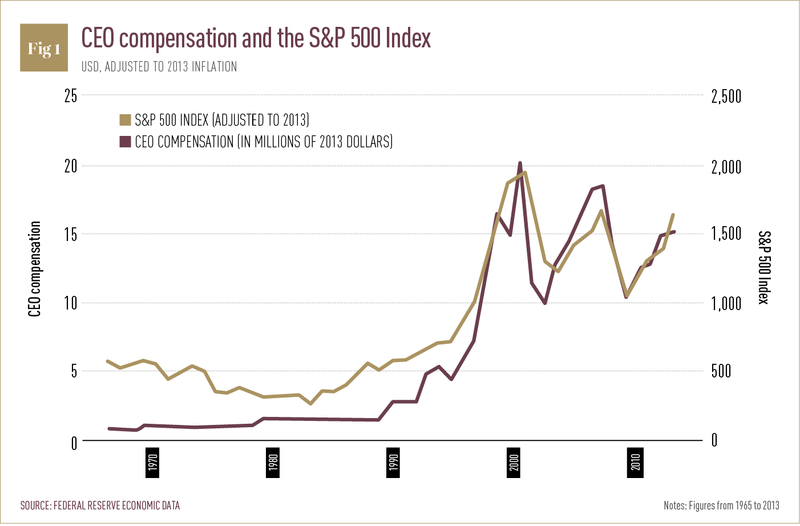 The answer to the so-called shareholder value problem – causing income inequality and low investment levels – is clearly to return to basics. The Fed and other central banks must reduce the assets on their balance sheets and stop pumping money into the stock market, so that those seeking investment destinations for their funds will invest it in productive plant with real prospects of wealth creation. The problem of shareholder maximisation is sought to be addressed by the authors by making an appeal to the good natures of capitalist shareholders and boards of directors. That will not work. One might as well ask workers in a socialist state to work hard because it is good for the poor people in society. It has never worked, never will. People respond to incentives. If shareholder value maximisation is a problem in the sense that profits are not reinvested in businesses, then incentives to invest in productive processes must be restored. That would firstly require that the incentives for the current alternative, namely to invest in paper assets, must be removed. Real productive investment in the form of factory plant, information technology and worker training must become a competitive alternative again by eliminating the easy, rent-seeking alternative of share pyramids on the back of asset inflation. In conclusion then, I do not agree with the diagnosis of the disease of stagnation in the so-called ‘neoliberal’ economies. In addition to targeting consumer inflation, there should also be targeting of asset inflation. Training and education should be beefed up. Labour markets and international trade should be freed up further. A good model to follow here is Switzerland. From a policy point of view, Switzerland is number four on the list of the freest economies in the world. It has good education, relatively low government spending for a rich country, low levels of labour regulation and union density and low tariff rates. It has high levels of basic, VET and tertiary training, high levels of investment, a strong non-inflationary currency, restricted state spending and a huge positive trade balance, and moderate and declining inequality of income. Where the developed world has gone wrong, is by growing state expenditure and regulation, and by giving the monetary printing presses free reign. It can all be fixed, but not by means of this protectionist, old-style unionist, neo-Keynesian recipe for disaster. “This article is not concerned about this parliamentary process per se, or whether or not the Constitution will be amended, but rather with the missed opportunity by most thought leaders on the land question to utilise this process to engender, at the basic minimum, a discussion about what is necessary to bring about deeper level transformation in South Africa. “The Constitutional Review Committee would demonstrate intellectual lethargy and cowardice were it not to pay special attention to the second part of the EFF motion, which asked the committee to ‘propose the necessary constitutional amendments with regards to the kind of future land tenure regime needed, taking into account the necessity of the State being a custodian of all South African land’”. In other words, the state should be made the “custodian” of all land, and no one should own property by way of registered title. How and by whom the rights of current owners are to be determined, is not clear. But this much we know: The state must manage the properties in its custodianship so as to reconstruct and transform the current economy in order to correct the status quo of skewed power relationships. The rule of law is a principle that is embodied in the SA Constitution. It has been recognised by our Courts, notably the Constitutional Court, as a fundamental part of the Constitution and the Law. It has been recognised as the principle that ensures that government action shall not be arbitrary. 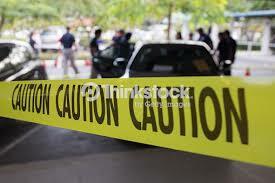 •	The requirement that all laws and rules must be known or reasonably knowable, and not have retrospective effect. The glue that holds these tenets together, the essence of the rule of law if you like, is the grounding principle that citizens of a country are to be governed by an objective body of law, and not by the arbitrary whims of people. Such a form of government is what stands as a barrier between ordinary citizens and tyranny. •	Publication and non-retrospective operation of laws means that the citizenry have a fair chance of arranging their affairs in a way that they stay within the four corners of the law, rather than being surprised by the whims of arbitrary decisions of officials. At first blush the principle of protection of private property does not seem to fit into this mould of non-arbitrary application of law. It is important however to know that most rule-of-law systems provide protection of private property in the form of a prohibition on the expropriation of property by the state save in the public interest and for fair compensation set by a court of law. b. subject to compensation, the amount of which and the time and manner of payment of which have either been agreed to by those affected or decided or approved by a court”. The SA Constitution makes it clear that its protection of property is a manifestation of the rule of law, by requiring non-arbitrary expropriation in the public interest. •	Firstly and perhaps most importantly, property may be expropriated only in the public interest. It is not permissible for an official or politician to expropriate property for the needs of a person, a political party or a politician or his family. That already embodies the central value of even-handed public-spirited decisions, rather than parochial confiscation. •	Thirdly, compensation must be set by a court of law, which contains in itself the idea of due process, and fair and unbiased decision-making. Over and above these considerations, it must be borne in mind that a society which does not protect property in this fashion is effectively one where the government has absolute say over the property of people, which includes landed property, movables and intellectual property such as patents, copyright and the like. That means that property can be confiscated at will, on the arbitrary say-so of politicians or officials. Such a society will be one governed by the whims of people, not laws. The idea that the right to private property is not a constitutional right in the normal sense, must thus be rejected. Even if we can however get past the legal difficulty that no modern-day constitutional state operates without adequate property protection, the question is how we see the proposal of the author unfold. As we see, the process of universal, once-off confiscation of title is the first step. The state would become the owner (custodian) of all property. Property as a means of production would thus vest in the state. In the context it goes without saying that such custodianship would be meaningless if the state cannot deal with the property within its discretion in order to transform the economy. Phrased differently, it would be meaningless if the state becomes no more than a nominal custodian, without the power to redistribute existing rights over property. If current owners’ legal position to all intents remains the same, the proposal seems futile. So it must be assumed that, although no previously disadvantaged person will get title in such a process of redistribution, he or she will get rights in respect of property. Given the skewed power balance that troubles the author, it follows without any question that current white owners will lose some of their rights, in favour of black persons. For example: A farmer, who owns the land on which he farms, will lose title to the government as custodian. The government for its part will then redistribute the right to farm on the property to the labour tenants or employees employed on the farm. This, the author tells us, is part of a bigger process to address the unequal relationships of power brought about by historical dispossession. Paraphrased, land is only one part of the jigsaw of transformation. The entire economy should undergo a similar process. By parity of reasoning, this can only mean redistribution of wealth in all its forms from white holders of economic power (except for land title, of course) to the previously disadvantaged. How else will it work? So then let us examine the origins of the economic power relations in our country, and let us have “a discussion about what is necessary to bring about deeper level transformation in South Africa”. What is wrong with redistribution of property/employment equity/affirmative action/BBBEE/black public-service employment/social welfare in order to provide redress for white privilege? These strategies all aim to improve the material conditions of life of members of previously disadvantaged groups. One way or the other they all take the shape of redistribution of wealth from a privileged group to a disadvantaged group. And the strategies redistribute on the basis of group identity, not on the basis of one identifiable individual having been unjustifiably enriched at the expense of another. If the latter had been the aim, the existing process of land claims under the Constitution would have done fine, and we needed not argue further. In South Africa the wealth divide is of course not perfectly aligned with race. Much less is property the defining distinction of wealth. Far from it. But it is historically significant enough to have enabled the proponents of these redistributive policies to make a fairly convincing argument as far as many in the mainstream media, politicians and academics are concerned. •	First of all, white privilege exists. By that I mean that white people on average have a historical advantage in the race to accumulate wealth. That does not only mean that they have more wealth and income, but more importantly, a greater ability to acquire wealth and income. That advantage has many aspects, including capital assets such as land and equities, education, technology, networks and inheritance. To simplify matters, let’s call these collectively “growth capital”, which of course includes property. o	Europe has far fewer geographic barriers and its plains are conducive to navigable rivers, which promoted not only internal trade, but also trade with China, India, the Middle East and ultimately Africa. •	The result was that by the time whites started colonising Africa, they were already millennia ahead in the race to acquire growth capital. •	To make things worse, when the colonisers arrived in Africa, for the most part they discriminated against the local African people, which caused them to perpetuate their historical advantages. For the moment let’s accept that in many cases that took the form of dispossessing black people of land. For ease of reference, I will call all these acts collectively “dispossession”, knowing that it may include dispossessing blacks from other forms of growth capital too, such as employment opportunities and education. •	Generally the dispossession directly impacted on the ability of blacks to accumulate growth capital. •	If whites had not so dispossessed local blacks from the time that they arrived on the continent some 300-400 years ago, blacks would have had an earlier head start in rectifying the backlog of growth capital; but white people would have been better off still, as they would have had richer markets of black buyers to which to sell their goods and services, and better-trained workforces. •	In the result white privilege is the result of a hodgepodge of reasons, from which it is impossible to unscramble the extent of the influence of dispossession on the relative growth capital of the races, from its other, age-old sources. •	The other fact to acknowledge is that the economy is a system with systemic characteristics, in the sense that any intervention in one aspect of it is bound to influence and affect other aspects. Most importantly, any intervention that impacts on the attractiveness of the economy (or specific industries or businesses in it) as investment destination, also impacts on other parts of it. For example, BBBEE legislation not only empowers some black beneficiaries, it also, besides deterring investment in businesses, causes lowered job creation. Or, at a more topical level right now, any threat to private property rights deters the purchase and development of property (as farms, factories, mines or retail operations for example) which once again deters employment growth. The upshot of all these facts is that, for historical reasons, on average there is a huge gap between average white and black growth capital. Now the point about growth capital is that it is meaningless as a form of redress for historical disadvantage, unless it makes a real improvement in the income of any beneficiary. That makes it significant that recent history has shown that – despite pervasive and continuing redistribution strategies – white people have not only maintained the income gap as against mainly African blacks, they have actually increased it. Despite the redistributive strategies of BBBEE, employment equity, labour law, welfare grants, public service employment given to blacks on the back of mainly white taxes, and so on, white people are still better off than blacks in terms of income, and increasingly so. That is the result of the historical advantage in terms of growth capital, but also the fact that whites have been incentivised by the very same redistribution measures aimed at helping blacks, to become more self-sufficient, to accumulate more growth capital than before, and on average to out-compete blacks. The main manifestation of black people on average falling behind, is unemployment. Since 1994 unemployment among black people has increased by more than 150%. None of the redistributive strategies has worked. On the contrary, there is a strong argument that redistribution has resulted in counterproductive outcomes. The key to all this is productivity. What I call growth capital, directly translates into productivity. And the most effective way to address that is education and work experience. It is no coincidence that in terms of a recent survey by the IRR, the most important problems for by far the greatest number of black respondents, were unemployment (38%) and lack of education (26%). Land was rated as most important by only 1%. It is no coincidence either that BEE deals in the guise of agricultural land reform have almost universally failed. For instance, an assessment of 39 land-reform projects in Limpopo reported by the Institute for Justice and Reconciliation in 2015 showed that these projects had ‘caused an 89.5% decrease in production, as well as many job losses’. The obvious reason is that black people, who would in a normal market not have been interested or able to enter the farming profession, receive land to farm. Very few successful black farmers have emerged in the process. Land is a productive asset for a beneficiary only if he or she has the ability to exploit it as growth capital. What is more, the vast majority of white people never acquired their income via the route of property. In fact, the shoe is on the other foot: They acquired education, which enabled them to get jobs, which in turn enabled them to take out loans from banks, with which to buy residential property. Far from denigrating the value of property, we should bear in mind that the 1 or 2 % of the population who make a living out of agriculture, are exceptional, not typical of white privilege. But not all education and all work experience is equal. Both of these will be optimal only if a fine balance is maintained between enabling the beneficiary to participate at a level that is easy enough to enable him or her to participate, but difficult enough to serve as a real challenge and learning experience. And the incentives in either case must be maximally conducive to top performance. In other words, the rewards (passing, distinctions, prizes and qualifications in the case of education, and appointment, remuneration and promotion in the case of employment) must be attractive enough to serve as the best possible spur to achievement, which can only occur if achievement matches the reward. Jobs and remuneration must match the productivity of workers. In short, both institutions must function on the principle of merit. Something similar applies to property. The benefit of land title is that land is then a tradable commodity. A purchaser of land is not the only conceivable person who can exploit it successfully. But he has one advantage over other players in the economy, and that is what is colloquially called “skin in the game”. A purchaser of land has an interest in ensuring that it is used economically optimally. This may take the form of developing it for own residential use, or as business premises, or as a farm or as a factory. Or simply as an investment. That interest creates an incentive to use the property as productively as possible. And even if he, and other owners, decide to hold on the property in the hope of realising a profit later, that will increase demand. If the demand is high enough, most owners will eventually sell. In that way the true value of property is determined, and it is not a wasted commodity. More importantly, such purchasers are best incentivized to develop properties as residential land, retail centres, farms, industrial areas or tourist destinations – all of which in turn will create employment. By contrast, in a situation where the state becomes the custodian of all land with the discretion to distribute rights thereto in the interests of justice, the law with one stroke of a pen destroys the market in land. That will have the effect of removing the merit principle, so essential to ensuring productive use of resources, from land. The ability to buy land is of course no guarantee that the purchaser has the skill to use it productively. But if he does not, he can sell or lease it to, or employ, someone who does. In any of these cases skin in the game ensures the best chance of a good decision on the merits. A puzzling idea underlying the thinking of the author is the notion that all races should be equitably represented in property rights. Why does it matter whether or not property or land is the particular form that growth capital takes? 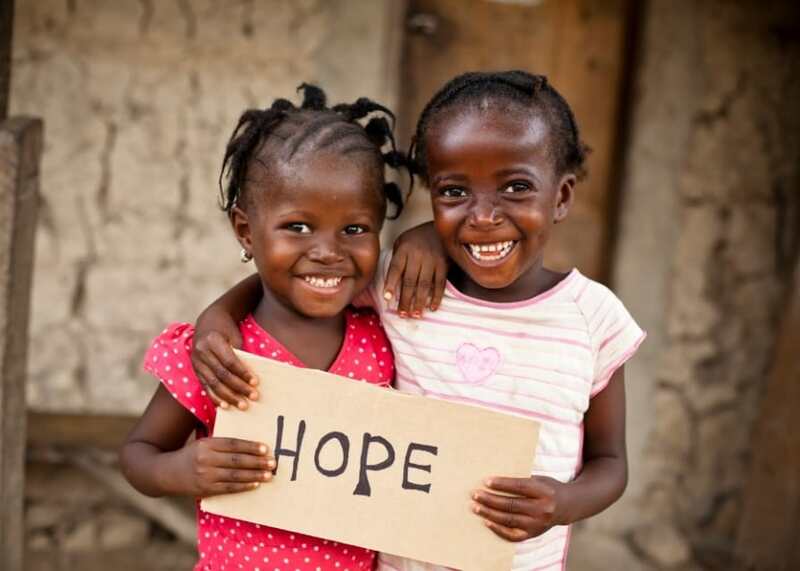 The facts on the ground show that education and employment are far, far more important as engines to generate income. The vast majority of well-off white people – who earn, say, more than R20 000 per month, whatever they do – do so not through the vehicle of property, but through employment, independent service contracting or ownership in businesses. It is precisely those people who out-compete blacks. They don’t do that by exploiting property. 99% of them are not farmers, landlords or property speculators. They are ordinary salary earners, professionals like lawyers, doctors or engineers, or entrepreneurs with IT companies, restaurant franchises or shops. What makes them prosperous, is not land, but education and productive work. In fact, it is their prosperity that enables many of them to buy residential properties, rather than the other way around. o	First and foremost, African blacks are so far behind in the race that only exceptional individuals will reach material parity with privileged whites. o	That they will do partly because of their inherent talent, but not only that. More importantly, black people mainly will become competitive with whites only if they try much, much harder. o	There is no alternative that is likely to be more successful – no leg-up or preferential pathway, or compensation for disadvantage in the form of any of the redistributive strategies discussed above. To use an analogy: In a sports league (rugby or soccer, say), it often happens that some players are injured because of foul play by others. Sometimes it is detected, and sometimes not. Either way, let’s say one of the players suffered a serious injury, causing him to undergo surgery, rehabilitation and a strenuous training programme to become competitive again. The only way that that player will get back to full competitive capacity (regain his “growth capital”, if you like) is by training much harder than the competition. o	That will have the result that the standards of competition in the old league will go into decline. In our economy we want the most serious players – investors, professionals and business leaders – to participate. The last thing we need is investors in property and property development being deterred because they do not acquire full dominion over their investment. And if we are serious about creating the best chance of bringing the previously disadvantaged up to par, we must make them compete on merit. In property development, merit means the greatest possible opportunity and incentive to develop property as productively as possible. “The idea that a freehold system of land tenure is a necessary requisite for development and investment is not new. 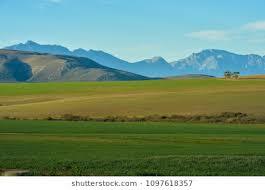 In South Africa at least, it began with the proclamation by the then Governor of the Cape, John Cradock, in 1813, which discontinued the system of loan farms in place since settlers started annexing land from Africans, and converted these into freehold titles. The belief at the time was that farmers did not invest as much as they should on the land because they did not own it. The right to own private property – with its necessary corollary that the law must protect it – is one of the two crucial ingredients of a free-market economy, the other ingredient of which is the freedom to contract for the exchange of goods and services with minimal intervention by the state. The better the protection, the higher the income. What is perhaps more important, is that property rights do not create inequality of income. On the contrary, there is a slight preponderance of income equality among countries with the best protection of property rights. What is more important, is that the first quartile of countries, those with better property protection and slightly more equal income, are countries where we have now seen that the average income is significantly higher than in other quartiles with less property protection. 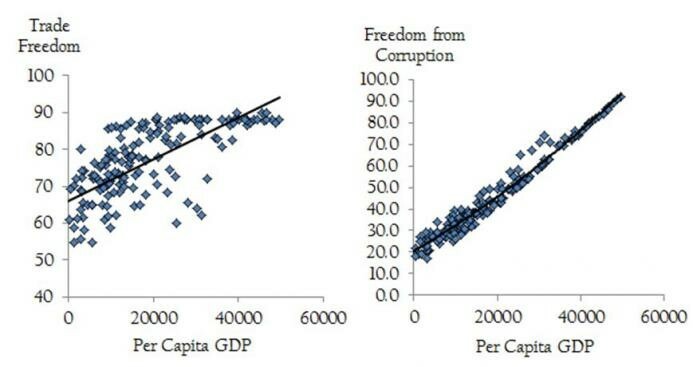 Simply put: the poor in those countries are significantly better off than elsewhere. That leads to the clear inference that property protection is on balance better associated with improvement of the life quality of the poor. So, the author could not be more wrong when suggesting that investment and growth do not depend on property rights. Finally the author attacks the idea that poor people should be given titles to property, whether land on which they already live or state land, as it will expose them to selling the land to the highest bidder, as they are not able to secure mortgages from banks to develop their land or themselves economically. This is the point at which we should remind the author that economic development is indeed a matter of total transformation of all aspects of the economy that created the skewed power balances about which he is so aggrieved. Nothing less than complete economic freedom will do. More in particular, it would indeed be futile to give poor people land or titles to land, and not equip them with the tools to exploit it productively. Without education, employment and freedom to trade goods and assets, no title to property will make a dent in this problem. One of the obvious problems being debated among policy-makers, economists and commentators is the low share of labour income compared to that of the wealthy, property-owning class, or the growing inequality of income, a phenomenon particularly notable in the US and other developed countries. This pattern is typically accompanied by growing wealth for the rich, especially growing equity values. What we see are various fluctuations, including three periods of wage growth, namely1982-88, 1996-2002 and 2014-2018. For starters, it is clear that the simple narrative that wages and salaries didn’t grow is not correct. 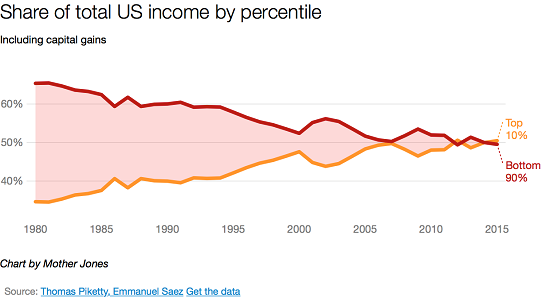 There has been overall growth in real income of 14% since 1980. As we will see below, the lion’s share of that went to the rich. But even so, it is useful to see what happened to cause intermittent periods of income growth, as I do a little later. Lowered interest rates self-evidently encouraged customers to borrow more from banks. The more money is borrowed, the greater the impact of fractional-reserve banking. That is because borrowers spend more money in the market, which in turn finds its way back to the banks as deposits. That, in turn, enables banks to lend out more money. It is clear that the early 1980s was the real watershed in this regard. Declining interest rates made it more and more attractive for businesses to borrow money from banks. This also was the period showing a trend for businesses to buy shares in businesses (including their own shares) instead of investing in research and development, training, new technology and new plant. Companies’ buy-backs of their own shares increased from about 5% in 1980 to close to 90% in 2000. The culture that took hold since the seventies has been one where consumption has been fuelled by debt, not productivity. “On account of loose monetary policy and the subsequent increase in the money supply, the process of wealth transferring from wealth generators to the holders of the newly created money is set in motion. Since this new money was generated out of “thin air,” nothing was exchanged for it, hence we have here an exchange of nothing for something. It is hardly surprising, then, that it is precisely the period from 1980 onward that was characterised by declining wages for the middle class and the poor. The reason for that is simply that the relative value of workers’ salaries and wages was watered down because the wealthy drew more dollars as a proportion of the total number of dollars in circulation. The pre-1980 era saw rising state spending and declining real wages. Then the Reagan years (1980-88) were marked by declining spending and an increase in wage income. Over the next 4 years the trends of both state spending and income growth were reversed. 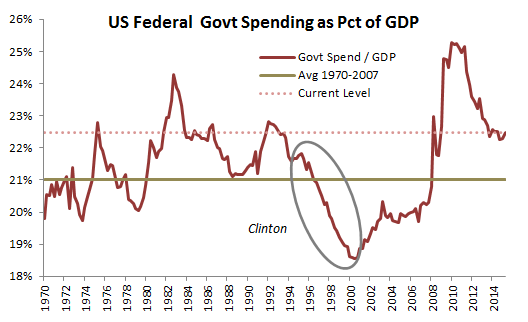 The Clinton era (1992-2000 – circled on the chart), was marked by deep cuts in government spending measured as a percentage of GDP, and wages growing in response to that. During the era of Bush (2) (2000-2008), spending rose sharply. Wage income remained largely flat, except for a spike right before the 2008 crash. Understandably, post-crash wages declined between 2008 and 2012. Then they increased again as the Obama administration managed to cut federal outlays. 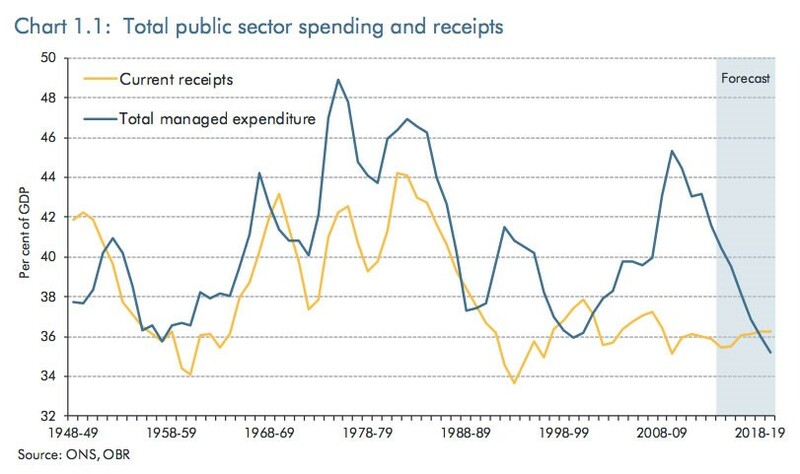 So in most periods wage growth largely formed a mirror image of government spending. The explanation for this seems to be that the more the government spends, the less the private sector is able to spend on productivity-enhancing research and development, acquisition of technology and training of workers. The exception to some extent is the 2008 year, which seemed to be a blip in this pattern. That was the year in which the Greenspan era reached its zenith. The priming of the economy created a once-off spike, after which it plunged to new depths. Long story short, in 2008 Greenspan’s effectively negative interest rates and the government policies designed to encourage a national splurge on new mortgage bonds resulted in the biggest financial collapse since the great Depression. For a brief period it seemed as if every indicator – home ownership, employment and income, seemed to hold the line. But it could never last. The plunge in wage income between 2008 and 2014 was a sickening drop. Now let’s interrupt the monetary narrative for a moment, and consider the impact of economic freedom, ie the degree to which individuals are free to engage in market transactions as measured by institutions like the Fraser Institute. 1980-88: During this Reagan era US economic freedom increased from 7.92 to 8.40, which, together with the decline in spending, helps to explain why wage income increased handsomely. 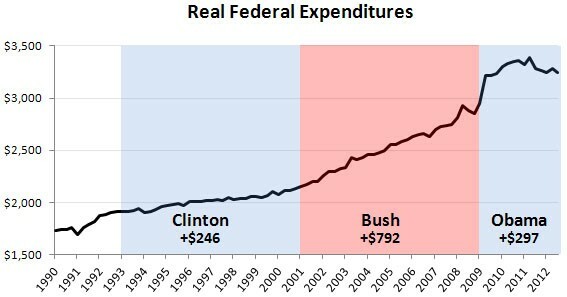 1992-2000 (Clinton): This was a good era in that economic freedom was high, and in fact increased, and spending was cut. It is no surprise that wage income grew. 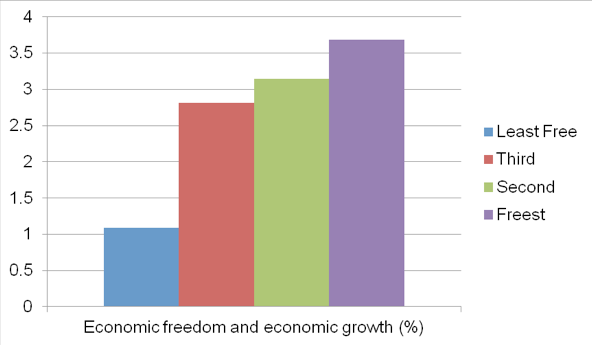 2000-2008: During this period (Bush (2)), economic freedom declined, and spending rose. Wage income trended downwards. 2008 to 2014: This era (under Obama) saw a significant decline in economic freedom. Despite his reining in spending somewhat, employment income dropped. The era of relative wage decline for the middle and poor sections of the population was introduced in about 1980, when the decline in the Fed’s interest rates and consequent money supply growth began. The broad trend of declining income for the bottom 90% has continued until now. But within that broad trend there have been multiple fluctuations that partly correlated with government spending: the higher the spending, the lower the wage growth, and vice versa. 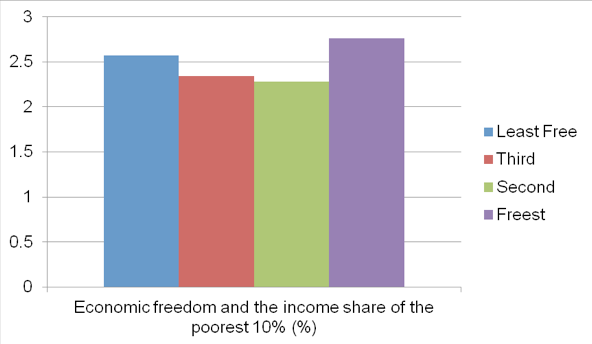 The growth or decline in wage income also correlated with economic freedom. The freer the economy during a particular era, the better the wage growth, all other things being equal. What the developing world (of which the US is a good prototype) thus needs, is a return to a real (as opposed to a paper) economy, where federal interest rates are a reflection of market demand (and not government fiat), where the money supply is stabilised and where state spending is reduced, making more available for private-sector investment.. That would incentivise private sector firms to spend on real productive capacity, as it will no longer be cheap and easy to buy shares in other companies or one’s own, on credit. A good dose of economic reform (towards freedom) and reductions in government spending are also crucial. Together these factors will improve productivity, the only realistic way to turn wage growth around. One should not hold one’s breath. There are far too many vested interests (central bankers, politicians, wealthy shareholders and pension funds, to name but a few) gorging at the feeding trough.